A collaborative project among Mom Egg Review, the ProCreate Project, the Museum of Motherhood, and The Mother Magazine, Mothers Are Making Art (M.A.M.A.) 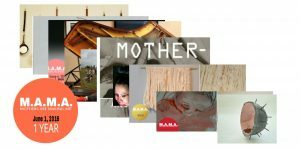 pairs work by mother visual artists with words from Mom Egg Review writers. The project recently reached its one-year anniversary and is still going strong. Follow the links below to view the collaborations. One Year Anniversary Art with Susan Vespoli’s “Sonogram” from MER 14. Artist Anna Hulton explores our connections with land; Samina Najmi’s prose piece “Blind Date” explores cultural mores. Artist Dagmara Bilon explores liberty and defying taboos. Her work is paired with Gabriella Burman’s creative prose piece, “On Friday Nights”. Next Article The Best Small Fictions 2016 – Stuart Dybek; Tara L. Masih, Eds.